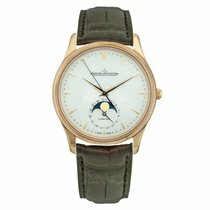 A beautiful Jaeger le Coultre Master Ultra Thin Moon, model designation 1362520. An 18ct rose gold 38mm case with ivory dial, centre seconds, sub dial showing moonphase and calender, presented on a matt brown alligator strap with gold pin buckle. Supplied new by Watches of Switzerland on 14th October 2016. The watch is complete with original boxes, instructions and Jaeger le Coultre warranty certificate. Call Dominic to reserve this beautiful Jaeger. We can arrange fully insured worldwide delivery, call or email Dominic for more details.